Sen. Jim Inhofe (R-Okla.) does not believe that humans contribute to global warming, and on Thursday he took to the Senate floor with some hard evidence in tow: a snowball. Then he threw it. In a speech criticizing the “hysteria” around global warming, Inhofe – who chairs the Senate Committee on Environment and Public Works – pointed to a particular snowstorm five years ago that set a new record at the time, seemingly suggesting that heavy snowfall is proof against climate change. Then he pointed to a snowball he brought into the chamber in a plastic bag. “In case we have forgotten, because we keep hearing that 2014 has been the warmest year on record, I ask the chair, do you know what this is?” Inhofe said as he took the snowball out of the bag. 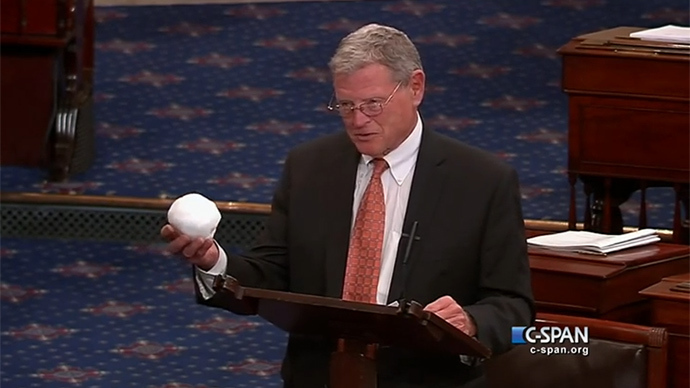 Inhofe then threw the snowball towards Sen. Bill Cassidy (R-La. ), who was presiding over the Senate. Inhofe is a well known opponent of the idea that humans are affecting the global climate, though he did recently vote to agree that climate change is real and not a hoax. Inhofe explained his vote by arguing that the climate changes all the time, though not because of human activity. Later Senate amendments that linked climate change to human activity did not earn his vote.